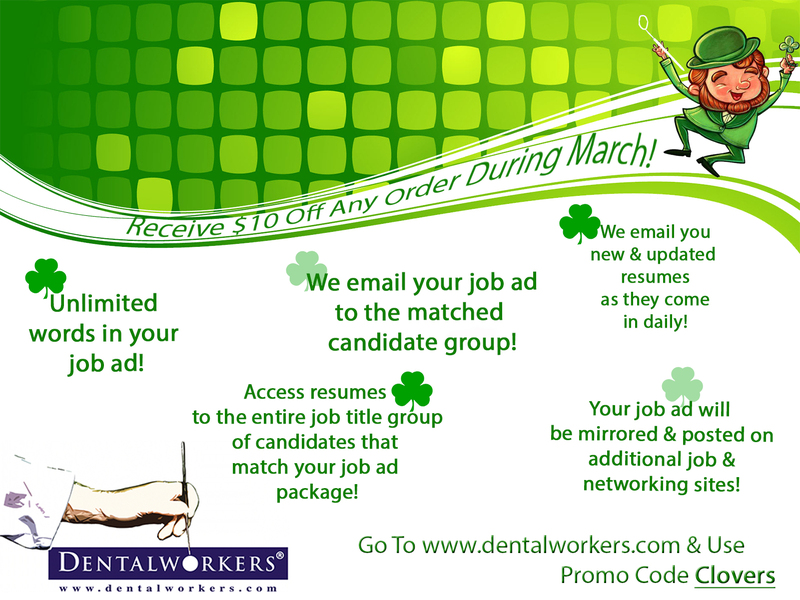 DentalWorkers Celebrates March With Special Savings For You! I Want To Save $10 Off Any Order! Fill out this form to learn more, or simply call 1-877-235-9855, ext. 1. We are bringing the luck of the Irish to everyone in March! Can you believe it's March ALREADY? It's nearly spring, and that calls for another great DentalWorkers' special! From March 1st through March 31st, save $10 off ANY order you place! Unlimited words in your job ad. Access to resumes in the entire job title group of candidates that match your job ad package. We email your job ad to the matched candidate group. We email you new resumes as they come in. Your job ad will be mirrored and posted on additional job and networking sties! Also, save $10 on Text and Banner ads! Don't forget to enter promo code Clovers when you check out! CALL US NOW at 1-877-235-9855, Extension 1 to take advantage of this amazing savings opportunity!